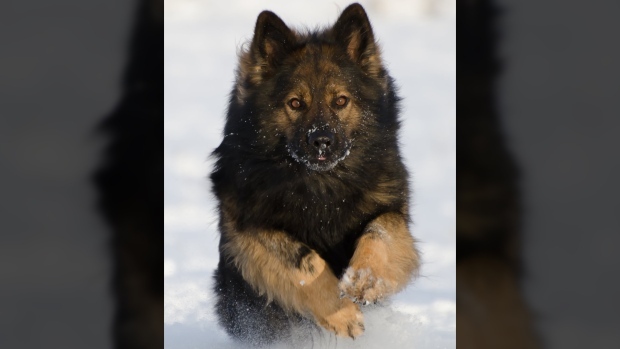 Jager, a Nanaimo police dog, is being applauded for finding a suspected car thief. A police dog is being applauded for finding a suspected car thief who was hiding in bushes near the scene, police say. Nanaimo RCMP responded to a call about suspicious activity early Tuesday morning. A resident of Verte Place reported seeing three people with flashlights near a black Honda Accord. After requesting Police Dog Services, Jager arrived and led officers to nearby bushes, where a woman was hiding. "This is an excellent example of why it is important to report suspicious activity immediately to the police," said Const. Gary O’Brien of Nanaimo RCMP. "As a result of one phone call, and thanks to Jager, a violent offender was taken off the streets and police were able to retrieve a stolen vehicle." The 30-year-old was arrested for possession of stolen property relating to the car that was reported missing from Nanaimo four days earlier. She was also arrested for outstanding warrants from across the island, including assault with a weapon. Her court appearance is set for Jan. 31.